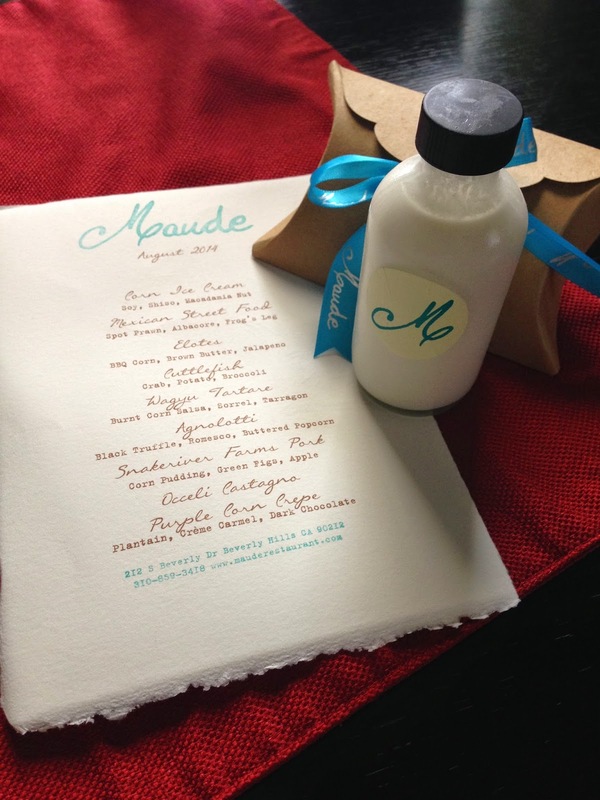 While I was in Los Angeles last week, I had the wonderful opportunity to eat at Chef Curtis Stone's new restaurant, Maude, which has been rated best restaurant in L.A. Normally the 25 seat restaurant fills up as soon as reservations open one month ahead of time, but when we got the call at 10 a.m. that a reservation for four had cancelled at the last minute for that night, we jumped at the chance. Each month, one seasonal ingredient is featured in a nine course tasting menu. You don't order anything - it is a set menu that comes to you when it is ready. The entire dinner featuring corn took 3 hours to eat and ended up being more like 11 courses excluding the homemade corn flakes and almond milk that we were given to enjoy the next morning. 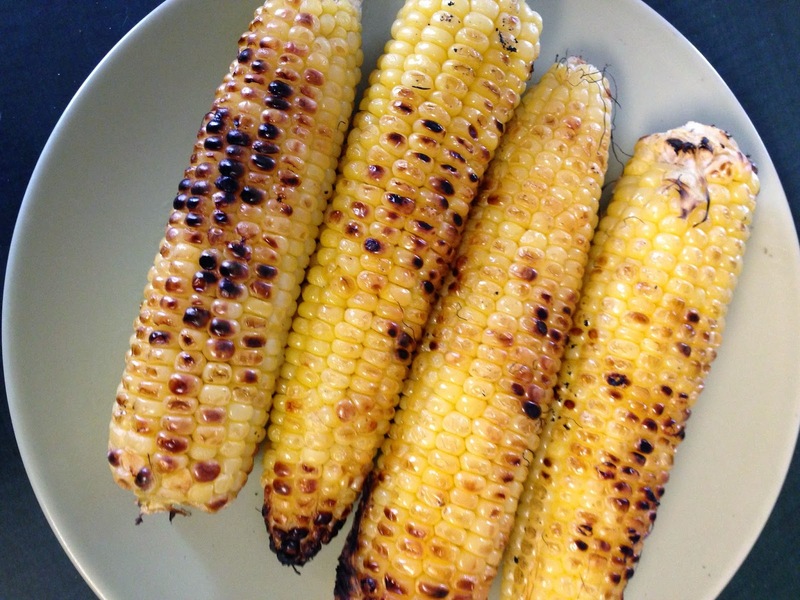 One of our favourite dishes was inspired by the grilled Mexican corn dish called elotes. Apparently the street version of this dish is sold outside many local Mexican grocery stores, but what we had was grilled corn elevated to a whole new level. The recipe below is my version of the elotes we ate at Maude, with a few more local Canadian ingredients. 1. Mix the yogurt and garlic together and set aside. 2. Brush or rub the corn cobs with the olive oil and grill them on a medium high barbecue for about 12 - 15 minutes, turning regularly. You want the corn to get brown char marks on it, though. 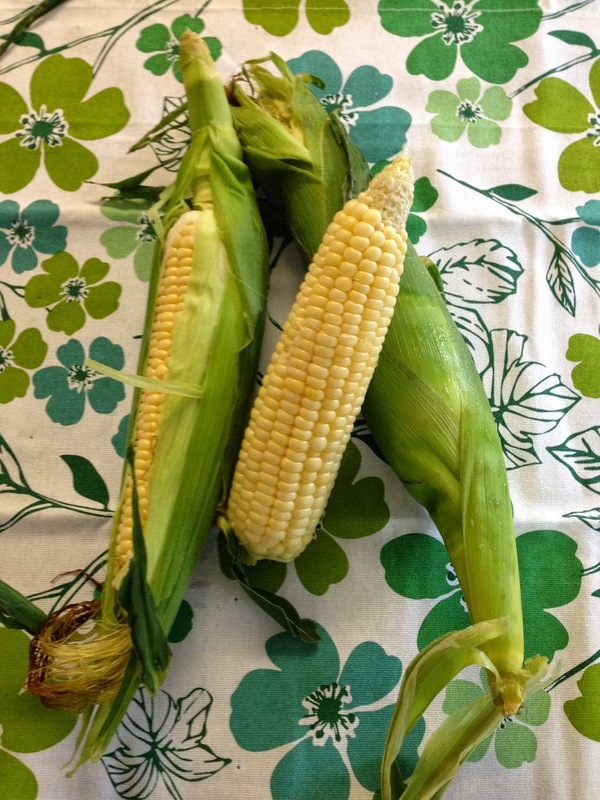 Remove from heat, let cool slightly, and then use a knife to remove the corn from the cobs. 3. In a pan on the stove, heat the butter until it starts to turn brown. Squeeze in the lime juice and turn down the heat so that it does not burn. Quickly toss the jalapeño and corn kernels in the butter to reheat them and remove the pan from the heat. Season with salt. 4. 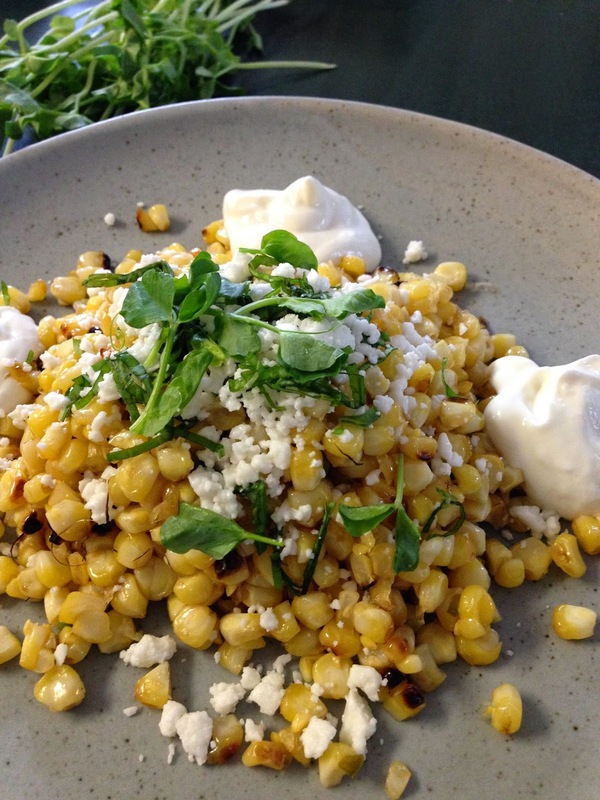 Serve the corn on a plate topped with the basil, feta, and pea shoots, if using. Serve the garlic yogurt on the side of the plate. Enjoy! 1. Feta is more commonly sold packed in water, but it should also be available in dry form, which is much more desirable in this dish since it is being used as a substitute for Mexican cojita, which is hard to find in Canada.